His work can be seen across a variety of different media applying his playful, tongue-in-cheek imagery with anti establishment values, he was also one of fifty artists commissioned to create a 50th anniversary Penguin book cover and is the only urban artist to date to be featured on the front cover of the fine art publication Art Review. His sell out solo shows ‘Death & Glory’, ‘EyeCons’, ‘aPOPcalypse now’, ‘All your Dreams Belong to Us’ along with Los Angeles show ‘Going Nowhere Fast’, which included his largest mural to date, and ‘Burn Brighter’ his debut Australian show have firmly founded D*Face’s presence within the global contemporary art market whilst retaining his notoriety. 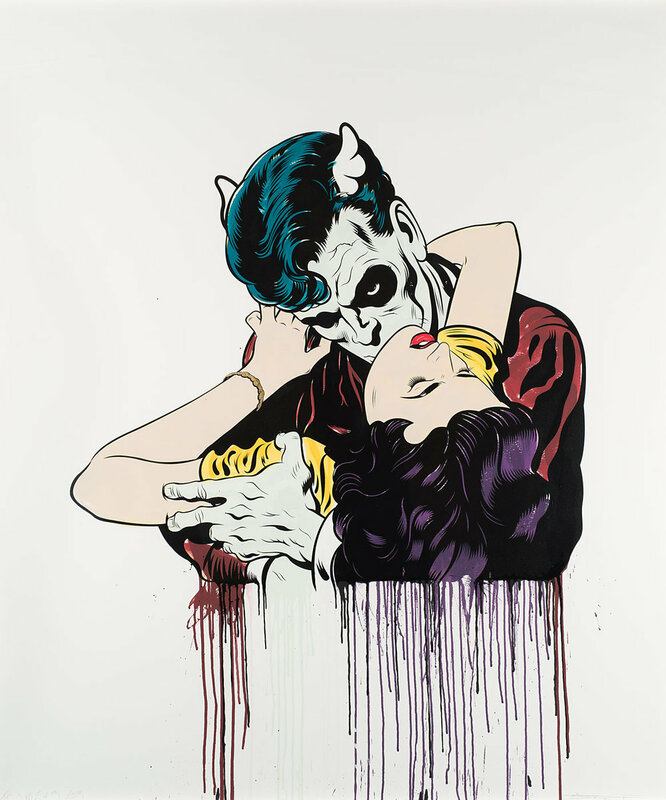 His work regularly sells at Christies, Sotherbys and Bonhams auction houses and yet he still continues to put his work illegally into the public domain, and as such has extensively traveled the world showing and disseminating his artwork. In 2005 D*Face set up the gallery ‘StolenSpace’, which continues to be Londons foremost contemporary urban art gallery. In 2010 he created the artwork for Christina Aguilera’s number one selling album ‘Bionic’, Christina has been a long time collector of D*Face’s work. 2011 marked a busy year for D*Face, between his two solo exhibitions in Los Angeles and Melbourne he found time to make a return visit to the Ridiculous Pool in San Bernardino, where he debuted a unique technique combining his love of skateboarding with live painting. The event was filmed and has since been featured on websites and TV shows around the globe, to date it has received 880,691 independent views on youtube, a figure that keeps climbing, seemingly along side D’s restless ambitions and popularity.